As an ingrediant in vegetable curry, steam first, then mix with steamed carrots, chopped tomatoes and garbanzo beans and your favorite Indian sauce (I like Pataks). Serve with cool yogurt sauce. Roasted, Ã la Mandajuice. Yum. In cauliflower cream soup; a creamy mix of cauliflower, onion, cream cheese and horseradish. I promise to publish the recipe before winter’s up! As a secret ingredient in chili. Yes, chili! I oversalted the pinto beans, and in an effort to save the batch, I added steamed pureed cauliflower while I was cooking the chil. You couldn’t taste it, but it added a touch of creaminess and yes, absorbed the salt. Steamed, then served cold, with a nice vinagrette, as the French do. Or, in a gratin, a creamed casserole. Steam, then place in a buttered bakin pan. Smother in white sauce, then sprinkle with grated cheese; cheddar or jack are best. Love this post! I also love cauliflower and you have given me some wonderful ideas! Recently, I’ve tried to be more creative with the vegetable “sides” I add to our evening meals. After a cauliflower au gratin, my 9 and 12 year olds told me they actually prefer our veg simply steamed! I do too and had been doing extra work hoping to please the kids. Turns out we all prefer our veg raw or steamed… maybe a bit of olive oil and pepper or a sprinkle of parmesan but that’s it. 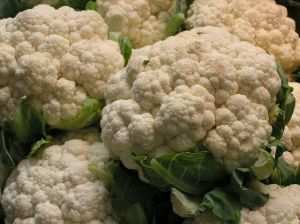 My favorite cauliflower is tossed in olive oil and roasted in the oven. Simple. Tasty. steamed, roasted, mashed, stir-fried, grilled. I have actually never tried roasted cauliflower – but I will tonight! I love roasted cauliflower. I make my own, but my favorite is from a local Indian restaurant. They marinate the cauliflower for 24 hours roast it and serve with a sauce.